International Lithium Corp. (TSX-V: ILC) is pleased to announce that it has closed the first tranche of its non-brokered private placement of units for proceeds of $1,200,000. On Closing, the Company issued 24,000,000 shares and 12,000,000 warrants. The securities were issued pursuant to a private placement of up to 50,000,000 units at a price of $0.05 per Unit to raise gross proceeds up to CAD $2,500,000. Each Unit consists of one common share of the Company and one-half of a transferable common share purchase warrant. Each Warrant is exercisable into one common share in the capital of the Company at an exercise price of $0.10 per share for two years from issue. Four non-arms’ length parties participated in the private placement for total subscriptions of $650,000: CEO and director, John Wisbey, CFO and director, Maurice Brooks, and directors Anthony Kovacs and Ross Thompson. The proceeds of the private placement will be used for exploration and the Company’s Raleigh and Mariana projects and for general working capital purposes. All private placement securities will be restricted from trading for a period of four months plus one day from the date of closing. The issuance of private placement securities to non-arms’ length parties constitutes related-party transactions under Multilateral Instrument 61-101 – Protection of Minority Security Holders in Special Transactions. Because the Company’s shares trade only on the TSX Venture Exchange, the issuance of securities is exempt from the formal valuation requirements of Section 5.4 of MI 61-101 pursuant to Subsection 5.5(b) of MI 61-101 and exempt from the minority approval requirements of Section 5.6 of MI 61-101 pursuant to Section 5.7(b). The Company did not file a material change report 21 days prior to the closing of the private placement as the details of the participation of insiders of the Company had not been confirmed at that time. International Lithium Corp. has a significant portfolio of projects, strong management, and a strategic partner and key investor, Jiangxi Ganfeng Lithium Co. Ltd., (“Ganfeng Lithium”) a leading China-based lithium product manufacturer. The Company’s primary strategic focus is now on the Mariana project in Argentina and on the Raleigh Lake project in Canada. The Company has a strategic stake in the Mariana lithium-potash brine project located within the renowned South American “Lithium Belt” that is the host to the vast majority of global lithium resources, reserves and production. The Mariana project strategically encompasses an entire mineral rich evaporite basin, totalling 160 square kilometres that ranks as one of the more prospective salars or ‘salt lakes’ in the region. Current ownership of the project is through a joint venture company, Litio Minera Argentina S. A., a private company registered in Argentina, presently owned 82.754% by Ganfeng Lithium and 17.246% by ILC. In addition, ILC has an option to acquire 10% in the Mariana project through a back-in right. The Raleigh Lake project, now consisting of 3,027 hectares of adjoining mineral claims in Ontario, is now regarded by ILC management as ILC’s most significant project in Canada. It is 100% owned by ILC, is not subject to any encumbrances, and is royalty free. Complementing the Company’s lithium brine project at Mariana and rare metal pegmatite property at Raleigh Lake, are interests in two other rare metal pegmatite properties in Ontario, Canada known as the Mavis Lake and Forgan Lake projects, and the Avalonia project in Ireland, which encompasses an extensive 50-km-long pegmatite belt. The ownership of the Mavis Lake project is now 51% Pioneer Resources Limited and 49% ILC. In addition, ILC owns a 1.5% NSR on Mavis Lake. Pioneer has an option to earn an additional 29% by sole-funding a further CAD $8.5 million expenditures of exploration activities, at which time the ownership will be 80% Pioneer and 20% ILC. With the increasing demand for high tech rechargeable batteries used in electric vehicles and electrical storage as well as portable electronics, lithium has been designated “the new oil”, and is a key part of a “green tech”, sustainable economy. By positioning itself with solid strategic partners and projects with significant resource potential, ILC aims to be one of the lithium and battery metals resource developers of choice for investors and to continue to build value for its shareholders. 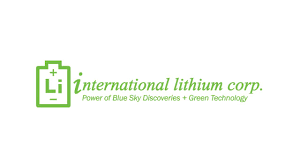 International Lithium Corp.’s mission is to find, explore and develop projects that have the potential to become world class lithium, potash and rare metal deposits. A key goal is to become a well funded company to turn that aspiration into reality.